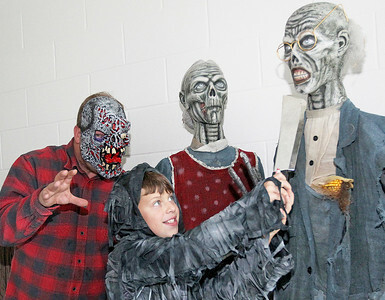 Candace H. Johnson-For Shaw Media Allen Pauley, of Trevor, Wis., and his son, Asher, 10, have some fun with the decorations on display during the Haunted Trail at the Lindenhurst Park District’s Community Center on Grass Lake Road. 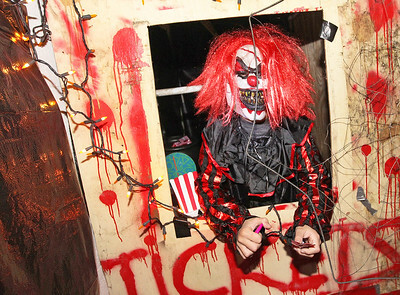 Candace H. Johnson-For Shaw Media Tyler Collins, 9, of Lindenhurst dressed up as a scary clown as he sits in a ticket booth handing out candy to kids in the Haunted Trail at the Lindenhurst Park District’s Community Center on Grass Lake Road. 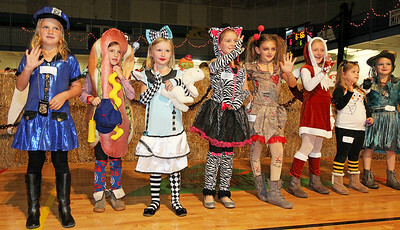 Candace H. Johnson-For Shaw Media Children ages 6-8 line up on the Cornstalk Stage for the Costume Contest and wave to their families during the Haunted Trail at the Lindenhurst Park District’s Community Center on Grass Lake Road. 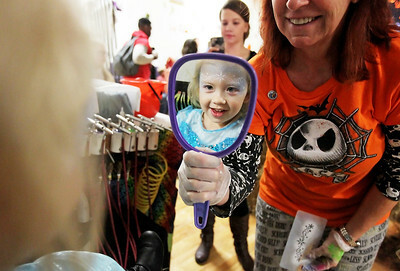 Candace H. Johnson-For Shaw Media Kylie Carter, 3, of Antioch looks at herself in the mirror after getting her face painted by Kat Beringer with Head 2 Toe Bodyart during the Haunted Trail at the Lindenhurst Park District’s Community Center on Grass Lake Road. 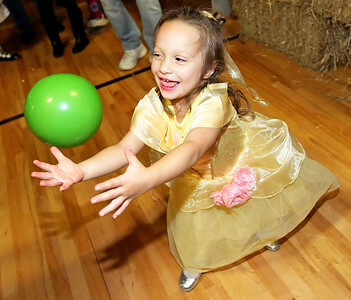 Candace H. Johnson-For Shaw Media Brooklyn Forth, 3, of Lindenhurst looks to catch the ball as she plays basketball for a prize during the Haunted Trail at the Lindenhurst Park District’s Community Center on Grass Lake Road. Candace H. Johnson-For Shaw Media Molly Finnegan, 17, of Lindenhurst hooks the fish with a prize as Eli Chand, 4, of Gurnee goes fishing during the Haunted Trail at the Lindenhurst Park District’s Community Center on Grass Lake Road. 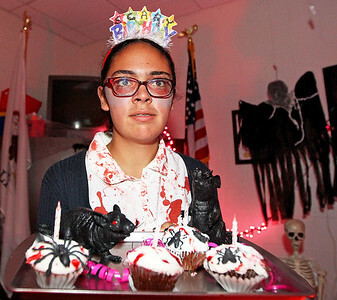 Candace H. Johnson-For Shaw Media Katie Ramirez, 16, of Round Lake shows off her scary cupcakes during the Haunted Trail at the Lindenhurst Park District’s Community Center on Grass Lake Road. 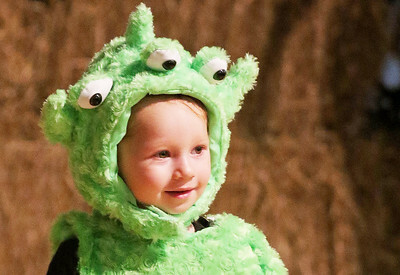 Candace H. Johnson-For Shaw Media Natalie Galvin, 2, of Trevor, Wis., waves to the crowd as an alien in the costume contest for ages 2-5 during the Haunted Trail at the Lindenhurst Park District’s Community Center on Grass Lake Road. 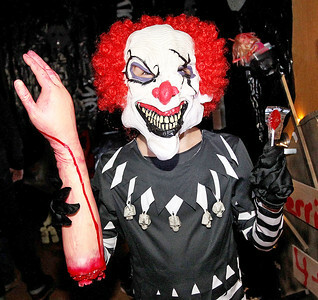 Candace H. Johnson-For Shaw Media Tyler Weber, 10, of Lindenhurst, as a scary clown, hands out candy in the Haunted Trail at the Lindenhurst Park District’s Community Center on Grass Lake Road. 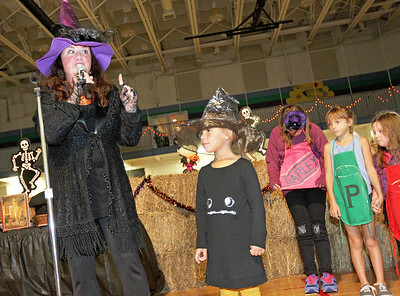 Candace H. Johnson-For Shaw Media Storyteller Paddy Lynn, of Mundelein tells the story of, The Magic Brew," with the help of Violet Wagner, 4, of Lindenhurst as they pull together special ingredients during the Haunted Trail at the Lindenhurst Park District’s Community Center on Grass Lake Road.